In the event of a leak the shutoff would be inaccessible. This was a supposed to be a barrier to keep vehicles from hitting meter on driveway beside the home. Never block gas shutoff valves! It seems more likely that a collision with this barrier would still rupture the gas lines and the shutoff valve would be inaccessible. We recommend removing rocks and concrete from blocking this meter and installing a proper crash barrier to protect it. Earthquakes are a part of life in this area of the country, everyone should know where their gas shutoff valves are and have a wrench handy incase of any problems. Even something as simple as moving a dryer if done without care can rip out a gas line. If you ever smell a strong 'rotten egg' odor immediately turn off the gas at the meter, open all doors and contact the gas company to diagnosis the problem. In addition, shutting off the main electrical breaker to the home may prevent ignition and possible explosion. 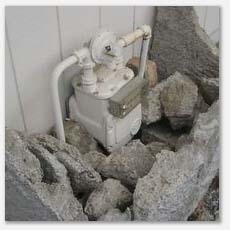 There is no more dangerous household utility problems then a major gas leak.